One of the things I love about working with a company like SPRO is it allows me the opportunity to focus on what I love to do most; catch fish. In my years of staying in the Big Bass Zone, I’ve grown to love swimbait fishing, and working with SPRO to produce the BBZ-1 and the additions to the family since have allowed me to pursue swimbait fishing in a new way. I’ve been able to work with the company to produce baits that are tailor made and perfectly matched to my style of fishing. Starting with the eight inch BBZ-1, and all the way down the two and a half inch Baby Shad; they were all designed to fill a specific need in my fishing. Part of my commitment as an angler, and now as a baitmaker has been to try and educate people in the ways I use these products to catch bass, big ones. My BBZ concepts have been developed to give anglers a systematic approach to dividing the water column, identify the strike zones or funnels that bass are using to ambush bait, and present a lure in the optimum way to trigger a strike. The BBZ concept has gained a reputation as a swimbait approach, but it is so much more than that. The BBZ has always been about defining the exact pattern that will produce results in the given circumstances. Whether the pattern of the day is throwing the biggest BBZ-1, using a SPRO Phat Fly on a Float n Fly rig, or using one of SPRO’s other top quality products to generate strikes; The BBZ is about fishing the conditions as they are. I’ve been fishing in Southern California for my whole life, and I’ve been here for the hey days of the hunt for the world record largemouth in the early nineties. In those days it seemed like dozens of giants were being caught every week; and that was before swimbaits really started becoming a tool of the masses. After swimbaits started making their place, anglers were catching big bass on the hottest big bait. Despite the numbers of big fish that were showing up there was a common theme, and that was the trout plants. Anglers were dialed into trout planting schedules, and you would often hear someone talk about going down to the lake to throw a big bait and catch one or more of the giant bass that were in the feeding frenzy as the hatchery trout hit the water. A lot of anglers caught a tremendous amount of big fish during the plants, but when Fish and Game was forced to stop the plants due to California’s concern over native species, the number of big fish being caught dropped off dramatically. The drop off was not because the fish weren’t there any longer, they certainly didn’t disappear through the spillway after the trout plants ceased; they just did something that anglers are often the last to do; adapt. One of the tenets of The BBZ has been to keep an open mind and fish the conditions, and while we talked last time about adjusting with the fish as they left the primarily trout based diet in California; it’s time to take a look at adjusting the other way again. We just got word that the trout plants are going to be starting again in select areas, and that means that swimbaits like the eight-inch BBZ-1 are going to be effective again. However, they will not be immediately the only thing bass will strike after plants start again, so going out with a plan is going to be critical. Here’s how I stay open minded in the BBZ. First of all, I love to catch giant bass on big baits, which is exactly why I designed the BBZ-1 in the first place. I also love the sight of the Department of Fish and Game planting truck backing down the ramp, because it means that bass are going to get tuned in to rainbow trout as a primary food source from the fall through the winter; eventually. To refresh you from last time, I believe that the biggest bass in the lake makes moves to stay alive, and when the fresh trout was dropped on the menu, they didn’t leave the restaurant, they just ordered a different meal. In the case of my home lakes, it meant that they went back to focusing on the prey that was their predominant forage prior to getting locked on to the hatchery trout; shad and crayfish. I still operated the same way that I had with the big baits. I looked for the proper feeding zones, and found the funnels that bass would use as ambush points with which to attack. I then worked to find the depth zone; top, middle or bottom that they were using, and sought to find the right lure to draw a strike. I would usually start with the four-inch BBZ-1 Shad, but if this proved to be the wrong size, I would go to the new two and a half inch BBZ-1 Baby Shad. But, in trying to operate within the principles of the BBZ, I wouldn’t limit myself to only a swimbait. SPRO makes a lot of other amazing baits that I would use if the circumstances meant I needed to do so. It shouldn’t surprise anyone to see me throwing one of John Crews’ crankbaits, Mike McClelland’s jerkbaits or Dean Rojas’ frogs. As much as I would love to use my signature baits to catch all of my bass, it’s just not feasible. With that being said, when the trout plants start again, I am going to have the appropriately sized BBZ-1 swimbaits on the deck. I will have an eight-inch BBZ-1 tied on my Big Bait rod with 25-pound-test Maxima Ultragreen on a Shimano Calcutta 400 reel, and it will always be at the ready. In fact, I will likely have all three sink rates on my deck. For quick recognition, I have a floating version in Silverfish color, the slow sink in Flat Rainbow and the fast sink in Glossy Rainbow. What this allows me to do is quickly glance at the baits and pick up the one I need in response to the way bass are acting. Again, just because the trout plants are starting, it doesn’t mean that all of the bass in the lake are going to immediately start feeding on trout aggressively. For the past couple of years they have been keyed in to the shad population, so it will take a while to switch completely. To take advantage of the trout plants, and angler needs to have a plan. The majority of the planted trout usually scatter fairly quickly, but a few pods hang around in the area near the plant site. The first place to check is in the pockets inside and the coves on either side of the marina. The other thing to look for is steep bluff banks in those areas. Trout will almost always get the attention of bass, even if they are not totally keyed in to them as their food source, that’s why you’ll often see followers behind and under your lure. If you’re seeing a lot of followers, the lure has their attention, but the size or the depth of the bait may be wrong. If I am throwing an eight-inch floater, I may turn to the eight-inch slow sink version to see if I can draw a strike. If I go through the series of sink rates of the BBZ-1 and don’t get strikes, then I will downsize to the six-inch BBZ-1 and start the process again. The best way to trigger immediate and aggressive strikes, especially from fish that are starting to tune in to the planted trout is to force them to do so by using the lake’s topography to your advantage. Remember that I talked earlier about bluff walls? They can be your best friend in these situations. I like to look at the wall and find all of the little outcroppings that bass can hide behind and use for ambush points. Rainbow trout will swim along these walls seeking the protection of the shade; little do they know that they are setting themselves up for the kill. This is when I start with a floating BBZ-1 and slowly crank it as close to the bluff wall as I can. Each time I get close to one of those little outcroppings that create a funnel for bass to use as a kill zone, I give the bait a little directional change, and hold on. 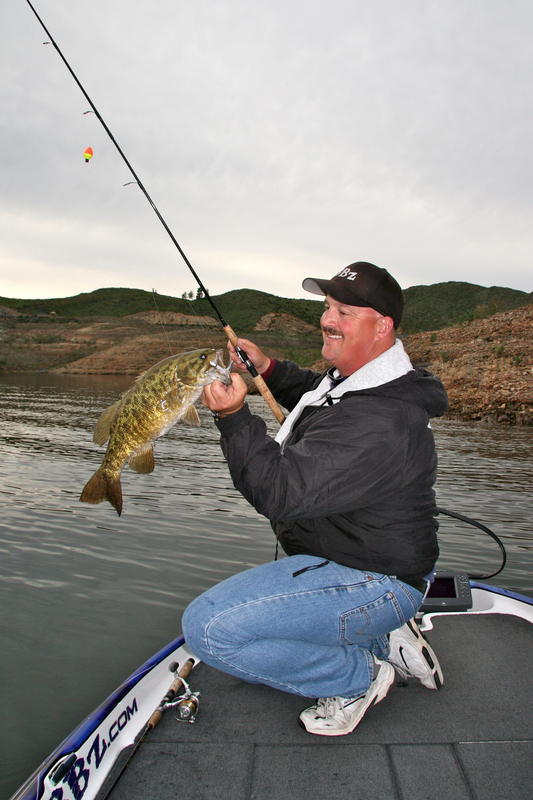 Bass can completely annihilate the bait as it pops around those outcroppings, no matter how slight it may be. Remember to think of things in terms of the top, middle and bottom concept, and if the floating BBZ-1 draws followers who don’t commit, use a slow sinker, and so on. If I get all the way through the BBZ swimbait family and haven’t produced results, then I turn to some of the other SPRO baits that can produce results. If a crankbait is the appropriate choice, then a Little John in shallower water, or Little John DD off the deeper edges are excellent choices. I could use a McStick or the new McRip jerkbaits if a stop and go retrieve is needed. If there is some overhead cover nearby, that is when I turn to the Bronzeye Frog, and sometimes these baits deliver when the swimbait won’t. Follow these tips from the Big Bass Zone, keep an open mind, and it could be Game on Baby for you too.